In the past year, there have been a number of very significant clinical changes that affect the way we diagnose, treat, and rehabilitate sports injuries incurred by elite athletes, weekend warriors, and patients with active lifestyles. The format is engaging and attendees are encouraged to pose questions in sessions and workshops as well as one-on-one with the national and international experts who will be delivering the updates and education at this event. Many of our patients run: some recreationally, some competitively, some professionally. The injury rate is estimated at 50% annually. This cutting-edge two-day program focuses on foot and ankle injuries, common yet challenging-to-treat locations in runners. Gymnastics is a sport where injuries are common, and these patients often have unique needs and sports-specific injuries. This one-day course given by former gymnasts, who are now sports medicine physicians and physical therapists, provides evidence-based learning on the medical care and rehabilitation of gymnasts. Hands-on workshops with current gymnasts will solidify evaluation and treatment principles. This course is open to all types of providers. Concussions are the most common sport-related head injury, yet treatment for concussions remains challenging. Emerging evidence shows exercise and active rehabilitation can accelerate recovery and return to play. This workshop provides training and hands-on experience in using exercise and rehabilitation protocols to enhance concussion recovery. 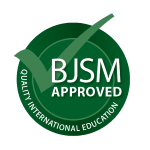 The top-rated sports medicine journal BJSM has recognized Sports Medicine 2019 as "Quality International Education." Click here to read a BJSM blog post about this course.